Rhode Islanders against mandated HPV vaccinations does not endorse any particular presidential candidate, but when the potential Vice President finds it acceptable to mandate Gardasil……. then we feel you need know that. If he is okay with bypassing your parental rights of choice for something that can not impact the classroom; then how well will your parental rights be respected in over all retrospect? Hillary Clinton accepts more money in her campaign from pharmaceutical companies then any other candidate. You need to vote for what you feel is the best choice, just as you need to choose what is the best choice for your family to get the Gardasil vaccine or not. In 2006, Kaine accepted $12,000 from Teva Pharmaceuticals TEVA, +0.18% to cover his expenses at the Democratic Governors Association meeting. A third of his donations come from big banks, or “securities and investments.” In Virginia, accepting gifts from special interest is considered a non-issue. The disclosures showed he received an $18,000 Caribbean vacation from Virginia-based tech investor James Murray, Jr., and in 2007 received $5,500 in clothing from Stuart Siegel of S&K Menswear, a company that declared bankruptcy in 2009. Teva Pharmaceuticals gave $12,000 for expenses incurred for the Democratic Governors Association meeting in Aspen in 2006. Obama for America had the largest disclosure–$45,075 for travel and lodging related to the 2008 presidential campaign. RICHMOND, March 2 — Virginia Gov. Timothy M. Kaine said Friday that he has decided to sign legislation requiring all sixth-grade girls to get immunized against a virus that causes cervical cancer if their parents don’t object. Kaine (D) had expressed “some qualms” this week about mandating that girls receive the human papillomavirus vaccine before entering high school, but he said many of those concerns were alleviated after he studied the bill closer. Virginia will become the second state to require the vaccine, which is called Gardasil. Last month, Texas Gov. Rick Perry (R) said girls in that state would also be required to receive it. At least 20 states and the District are studying similar proposals. New Jersey-based pharmaceutical maker Merck & Co. received federal approval in June to sell the vaccine. Merck began a nationwide lobbying campaign to try to get states to mandate the vaccine. Merck suspended its campaign two weeks ago amid questions about whether profit, instead of public health, is guiding the debate. In Virginia, parents will be able to opt out of the requirement without citing a reason. HPV is a sexually transmitted virus that causes almost 7,000 cases of cervical cancer annually. A federal study released Wednesday estimated that 7.5 million girls and women ages 14 to 24 have been infected with the virus. Because the virus is transmitted through sexual contact, some parents and politicians worry that mandating the vaccine might encourage promiscuity. But a bipartisan majority in the General Assembly voted overwhelmingly in favor of the mandate. The bill would take effect in 2008, making the 2008-09 school year the first that girls would be required to receive the vaccine. Supporters said that provides officials enough time to study side effects. NACCHO HPV Stance – a statement from a group you’ll wish didn’t exist. Below you will read, what you will not believe. The recent HPV mandate proposal in a PA county….. well this might have been some motivation. #InformedConsent becomes a job for parents and patients everywhere. Is this how it should be? The only way to stop the mandates and the infringements on our civil rights is to take the job around informed consent seriously. Do NOT stop asking questions, do NOT believe everything your doctor tells you. Much of what they are taught was a paid for message or something that comes down from a group or organization they trust, one they may not have investigated the motives or money trail of. Please read below in full, and be on the look out for what this group could encourage in the future. The National Association of County and City Health Officials (NACCHO) supports strong coordination, collaboration, and communication among public health, healthcare providers, parents and caregivers, and community partners at the local, regional, state, and federal levels to increase human papillomavirus (HPV) vaccination coverage in both males and females according to the recommendations of the Advisory Committee on Immunization Practices (ACIP). Local health departments should implement and adapt programs and policies to increase vaccination rates in their communities.  Establishing themselves as trusted sources of information about HPV and other vaccines in their community. Local health departments should consider developing or maintaining the capacity to bill third-party payers for the vaccine and administration to ensure long-term programmatic sustainability. NACCHO also encourages continued state and federal support of local health department efforts to establish HPV initiatives, sustain program activities, and collaborate with public health partners. Increasing access to healthcare may also lead to increased HPV vaccination rates since adolescents with health insurance and high healthcare utilization are associated with higher vaccination coverage.14 Misinformation about HPV and the HPV vaccine are pervasive in many communities, which can be overcome through effective communication campaigns. Racial disparities also exist in HPV vaccination coverage, as lower rates of series completion have been shown in African-American females compared to other groups15; thus addressing systemic issues such as health inequity may help increase vaccination rates. 1. International Agency for Research on Cancer. (2007). Monographs on the evaluation of carcinogenic risks to humans. Volume 90: human papillomaviruses. Lyon, France: World Health Organization, International Agency for Research on Cancer. 2. Gillison, M.L., Alemany, L., Snijders, P.J., Chaturvedi, A., Steinberg, B.M., Schwartz, S., et al. (2012). Human papillomavirus and diseases of the upper airway: Head and neck cancer and respiratory papillomatosis. Vaccine, 30(5 Suppl. ), F34-54. 3. Chesson, H.W., Ekwueme, D.U., Saraiya, M., Watson, M., Lowy, E.R., & Markowitz, L.E. (2012). Estimates of the annual medical costs of the prevention and treatment of disease associated with human papillomaviruses in the United States. Vaccine, 30(42), 6016-9. 4. Markowitz, L.E., Dunne, E.F., Saraiya. M., Lawson, H.W., Chesson, H., & Unger, E.R. (2007). Quadrivalent human papillomavirus vaccine: Recommendations of the Advisory Committee on Immunization Practices (ACIP). Morbidity and Mortality Weekly Report, 56(RR-2), 1-24. 5. CDC. (2011). Recommendations on the use of quadrivalent human papillomavirus vaccine in males — Advisory Committee on Immunization Practices (ACIP), 2011. Morbidity and Mortality Weekly Report, 60(50), 1705-8. 8. CDC. (2014). Human papillomavirus vaccination coverage among adolescents, 2007–2013, and postlicensure vaccine safety monitoring, 2006–2014 — United States. Morbidity and Mortality Weekly Report, 63(29), 620-4. 9. Elam-Evans, L.D., Yankey, D., Jeyarajah, J., Singleton, J.A., Curtis, C.R., MacNeil, J., et.al. (2014). National, regional, state, and selected local area vaccination coverage among adolescents aged 13-17 Years — United States, 2013. Morbidity and Mortality Weekly Report, 63(29), 625-33. 10. Stokley, S., Cohn, A., Jain, N., & McCauley, M.M. (2011). Compliance with recommendations and opportunities for vaccination at ages 11 to 12 years: Evaluation of the 2009 national immunization survey-teen. Archives of Pediatrics & Adolescent Medicine, 165(9), 813-8. 11. CDC. (2013). Human papillomavirus vaccination coverage among adolescent girls, 2007-2012, and postlicensure vaccine safety monitoring, 2006-2013—United States. Morbidity and Mortality Weekly Report, 62(29), 591-5. 12. Gargano, L.M., Herbert, N.L., Painter, J.E., Sales, J.M., Morfaw, C., Rask, K., et al. (2013). Impact of a physician recommendation and parental immunization attitudes on receipt or intention to receive adolescent vaccines. Human Vaccines & Immunotheraputics, 9(12), 2627-33. 13. Reiter, P.L., McRee, A.L., Pepper, J.K., Gilkey, M.B., Galbraith, K.V., & Brewer, N.T. (2013). Longitudinal predictors of human papillomavirus vaccination among a national sample of adolescent males. American Journal of Public Health, 103(8), 1419-27. 14. Kessels, S., Marshall, H., Watson, M., Braunack-Mayer, A., Reuzel, R., & Tooher, R. (2012). Factors associated with HPV vaccine uptake in teenage girls: A systematic review. Vaccine, 30, 3546-56. 15. Curtis, C.R., Dorell, C., Yankey, D., Jeyarajah, J., Chesson, H., Saraiya, M., et. al. (2014). National human papillomavirus vaccination coverage among adolescents aged 13-17 years — National Immunization Survey — Teen, United States, 2011. Morbidity and Mortality Weekly Report, 63(2), 61-70. Roughly 1.8 billion adolescents and young adults between the ages of 10 and 24 live in today’s world, representing the largest generation of adolescents in human history. These young people face never-before-seen shifts in populations, economies, technology, health, and the environment. The benefits of helping today’s adolescents navigate these shifts and develop into healthy adults extend to future generations. In recognition of the critical need to support adolescents, The Lancet Commission on Adolescent Health and Wellbeing released a report on the current state of adolescent health around the world, and the challenges and opportunities for addressing it. Below are some key findings from the report. Why Should We Focus on Adolescence? In the United States, early childhood is widely recognized as a critical developmental period, but adolescence garners far less attention, despite its importance in establishing adult health and stability. During the teen and young adult years, the tremendous physical and mental changes that adolescents undergo prime them for creating their own lives beyond their families. While timing and appearance vary, adolescents pass key milestones on the road to adulthood, including completing education, finding a job, and establishing romantic partnerships and/or other social connections. As the phase in life directly preceding adulthood, adolescence has large and immediate impacts not only on young people themselves, but future generations. Today’s adolescents are the next in line to fill the workforce and create families. Through their development and completion of milestones, adolescents build and acquire the health, financial independence, and social capital that they will use not only in their adult lives but that they will pass on to their children. Taking action for adolescent health now ensures the health of future generations. 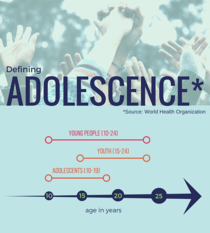 What Does Adolescent Health Look Like Today? The increasing number of adolescents is partly related to advances in health and medicine, particularly in eliminating infectious diseases. However, this progress has not spread evenly across the globe, and as a result, countries have radically different adolescent health profiles. About one third of adolescents (661 million) live in non-communicable disease (NCD) predominant countries. Most high-income countries fall into this category, including the United States. The top adolescent health issues are related to mental and substance use disorders (e.g., depression, tobacco use) and chronic physical diseases (e.g., diabetes). Roughly one in eight adolescents (219 million) lives in an injury excess country, where unintentional injury and violence are the primary causes of disability and death. Half of all adolescents (917 million) live in multi-burden countries, where both injury and NCDs are a major concern along with infectious disease, malnutrition, and other conditions related to poverty. Most of the countries in Africa fall into this category, along with India and its neighbors, and several Southeast Asian island nations. Additionally, wide variation may exist within particular countries. For example, four of China’s provinces could be classified as injury excess, even though the country is classified as NCD prominent overall. Health is also influenced by varied social and structural factors known as the social determinants of health. While a number of social determinants impact adolescents, The Lancet Commission specifically identifies four: family, peers, education/employment, and the media. What these determinants look like and how they affect health are rapidly changing, creating unprecedented challenges and opportunities for adolescent health. While the adolescent health issues facing countries and localities differ, all communities can take action to support adolescent health and development. What Can We Do to Promote Adolescent Health? Addressing the health needs of today’s adolescents can seem like a daunting task, but there are several key opportunities that offer hope. In particular, guaranteeing and supporting adolescents’ ability to access and complete their secondary education has been named as the single best investment for their health and well-being. Other opportunities identified by the Commission include addressing preventable and treatable adolescent health conditions (e.g., HIV/AIDS, injury, infectious diseases) and establishing systems that train, mentor, and encourage the participation of youth health advocates that make health care more responsive to adolescents’ needs. The report points out that the most powerful actions for adolescent health cut across sectors and include multiple components. OAH’s national call-to-action, Adolescent Health: Think, Act, Grow® (TAG), seeks to foster this multi-level, multi-sectoral collaboration. You can use the TAG action steps to support adolescent health in your work. Over the next four OAH Picks, OAH will delve further into The Lancet‘s primary social determinants of health affecting adolescents, how they relate to the outstanding opportunities for adolescent health, and tools that youth-serving professionals and others can use to promote adolescent health. This message does not target vaccines, however based on the current trend set by the HHS at the federal level this could be a warning to keep our eyes peeled for this age vaccine targeting. Follow our blog today and stay up to date with our posts. MANY OF MY FELLOW sojourners on Facebook have thanked me for fighting back at the – read this slow – proposal to write a proposal for a mandate for HPV vaccination in Allegheny County, PA that the Allegheny County Board of Health (ACBH) was contemplating. While it’s true I’ve been involved the spotlight really goes to the ladies of the local contingent of the Pennsylvanian Coalition for Informed Consent and the members of the general public who stood up and said #nohpvmandatePA. I was invited to participate in a meeting w/these truth warriors and defenders of health rights, and I can attest that no board, no committee, no legislative body will ever succeed in mandating HPV in the Pennsylvania as long as they have to deal with this coalition. They are organized, informed, dedicated, and, most importantly, growing. The RI Dept of Health recently sent out postcards direct to minors and also robo called homes of 7th and 8th grade parents in regards to vaccinations. Some calls were for multiple vaccines and some focused on the HPV vaccine. None of this effort gave risks vs benefits data or disclosed exemption options. We are working to counter the efforts of the Dept of Health with informed consent via our Awareness Campaign. They have over a half million dollars to which they can delegate to different forms of marketing. We don’t need that much to still be loud and keep citizens informed. Our current goal is $2500, If you give $8 or $80 or $800 it makes a BIG difference. Help with whatever amount you are able. 100 people giving $25 puts us at our goal. This is not just a RI issue, this is a national issue. RI reports the strategies to the National Vaccine Advisory Committee, along with their % of vaccinated children in the age range. NVAC is already advocating for minor consent without parental consent of the HPV vaccine, we need to show that we can and we WILL fight back. The nation leaders need to know that mandating HPV vaccines on any level anywhere in the USA is not acceptable. This is very important issue on so many levels. Calling homes with automated messages, for a vaccine that this state has one of the highest vaccination rates in the country. The RI Dept of Health has never been challenged by the public like we have done in the last year. They stepped up their efforts, we need to STAND UP STRONG. It is time to put them on the Defense. The more you give the more we can do. We sent out an email that it seems many may not have received, you can find that message here, if you didn’t get a message recently. The Dept. of Health doubled their efforts with postcards. Each one was sent in the name of the student and was marketing vaccinations. Direct health decision information mailed and marketed to minors. When did it become appropriate to bypass the parent for a medical procedure? Why is proper informed consent not being utilized? Why is there no mention of the religious or medical exemptions? In 2014, the same year the vaccine was mandated, the RI Dept. of Health received a grant for the HPV vaccination of over $638,000. The grant money line item breakdown shows that none of the money is to purchase the vaccine or to subsidize the vaccine cost. The grant for over a half million dollars is to market one specific vaccination. Federal grant money, our tax dollars, was awarded in this large sum to the smallest state in the nation. So far none of their efforts have included risks vs benefits, which is essential to any medical procedure, or that Rhode Island has exemptions for parents. They have not yet returned a phone call from a group member, to determine if the grant was part of the National Vaccine Advisory Committee test market campaign of 2014.